When we decorated the library, I originally had a second-hand, sorta wobbly chinoiserie tea table in front of the fireplace. The price was right and our budget was gone after paying for upholstery and built-ins, and it looked nice from a distance. However, with two rambunctious boys (even though they had to be on good behavior in the room), it just wasn’t standing up to the durability test. Not to mention, when the fire was blazing, I often found myself looking for a place to put up my feet. I’d always wanted a rich, tufted leather ottoman there, and I wished I’d just ponied up during the original decoration process. A year later, I was out of cash and out of luck. I didn’t want to go Big-Box-Made-in-China when the rest of the room had been done with such care and quality, even when choosing vintage pieces, but new projects (like replacing rotting siding) had priority in our funds. What to do? The frame is solid and of high quality and you already had it. Or the frame is solid and of high quality and was purchased dirt cheaply. The piece would cost significantly more new, even when factoring in labor and fabric cost. You don’t want to put another hulking piece of furniture in the landfill. I wanted something like this. 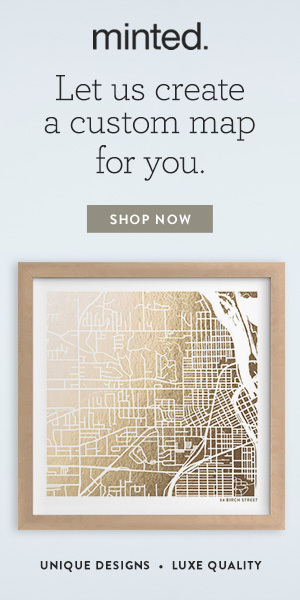 But I knew that if I had to ask the price, I couldn’t afford it. I didn’t have any design trade resources at the time. Then I found this on Craigslist for $75. 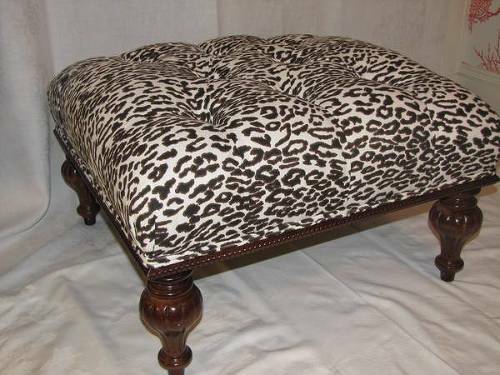 It was a Calico Corners 27 inch square ottoman (since discontinued, but something similar here). CC frames are bench made in North Carolina, so I knew it was good quality, and, even accounting for labor, I was saving at least $500. No, I didn’t actually have to go into the prison to get my ottoman. (You go to the warehouse across the street.) I just posted this photo for dramatic effect. A little backstory. The upholstery shop at NH Correctional Industries was founded in 2000/2001 as a result of an editorial mistake by the Boston Globe. Apparently, the Globe reported that there was one (there wasn’t), but after more than 60 calls came in expressing interest, the powers-that-be (or were, as it were) thought perhaps it would be a good idea. Two inmates with upholstery experience, one from out of state, were brought to Concord, NH and the program was born. Since its inception, the shop has been exclusively a mentorship program with inmates teaching inmates. Rules are, as you might imagine, incredibly strict. Employment is a privilege to be earned. A violation of any of more than 70 prison rules can be grounds for permanent expulsion. Inmates begin at the beginning — learning how to sew. A talented individual might take about 9 months of daily, full-time work to a become proficient upholsterer. The shop typically employs 16 inmates, with up to 8 projects going at a time. The intrepid Jerry T. runs the program. Hi, Jerry! When I said Jerry was intrepid, I meant it. How would you like to have a perpetrator of a violent crime wielding a hammer next to you? See this wall of tools? This is the Shadow Wall. Every tool has a corresponding black painted “shadow” behind it, showing which tool is out on the floor being used. Tiny little red tags with a number show which inmate has checked the tool out. At the end of the day, every single tool must be accounted for, down to the smallest NEEDLE. Then all inmates are subjected to a pat-down and the metal detector before it is safe to close. Anyone like to sew, all you out there in the blogosphere? How many needles have you lost and not even realized it? In a prison setting, an unaccounted-for needle can cause a lock-down situation until it is found. But I’m getting dramatic again. The major benefit of the program, and one far more important than that which the customers enjoy, is to the inmates themselves. Keeping busy in a constructive manner helps release the tension that automatically inhabits the prison environment. Inmates see that their daily efforts pay off in the skills they acquire and have something to be proud of — can point to something and say, “I did that.” Whether or not they go into the profession when they leave prison, those involved in Correctional Industries are less likely to be repeat offenders. Cost to the consumer ($410 base price for a sofa, $265 for a chair, with extra for fancy tufting and cushion rebuilds) is basically enough to cover the costs of maintaining the shop and paying the workers ($3/day for new workers, a whopping $5/day for mentors). The State doesn’t want to undercut independent upholsterers who need to feed their families and so has never advertised the service to the wider community, instead relying on word-of-mouth referrals. However, that network of neighbors has made the shop popular enough to have an 8+week wait to start a project. If you’re broke enough, or highly civic minded, it’s worth the wait. They do everything a good upholsterer should — match patterns, fix frames, retie springs, remake cushions, both foam and down. Testing the Foam. This One’s Shot. Many upholsters have insurance. 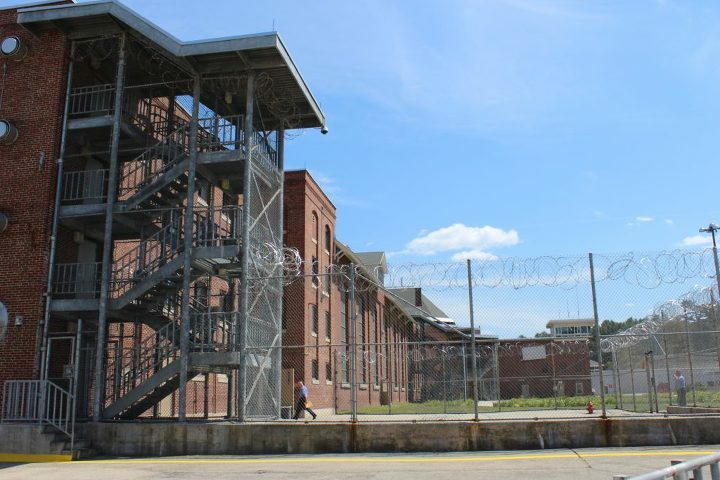 Correctional Industries is only insured as far as the State is insured. What does that mean for you? If the guys drop something, break something, tear something, etc., Jerry and his crew will make every effort to fix, redo, reorder fabric, etc. But can they write you a check for your loss? No. Nor will the State. The risk is written into the contract you sign with the job. The wait is a major bummer, and potentially a deal-breaker if you’re on a deadline. This is a training program where the workers learn by doing on the real McCoy when deemed ready, and that means an occasional mistake. (Did you know that your that your friendly neighborhood surgeon learned the same way — but on people? Puts it in perspective.) Jerry usually recommends buying about 10% more fabric that he thinks he’ll need to allow for it, and if no mistakes are made, you’ll have extra for arm covers or pillows if you want them. You need to know if your fabric needs a knit backing or not. Not all upholstery fabrics are created equal. Many types, like silk and some linens and chenilles — ones that flex a lot when pulled on the bias or have a looser weave — need to have a knit backing. Otherwise the fabric will stretch over time or may pull apart when sewn. See below. When in doubt, call the manufacturer and ask. Let’s see what these boys can do. The curved sofa below is super cool and was not easy to do, I imagine. Sweet slipper chair. Would have loved to see it in a more fun fabric. The customer should have called me first! They also fix rush and cane furniture. Love the lines on this piece. 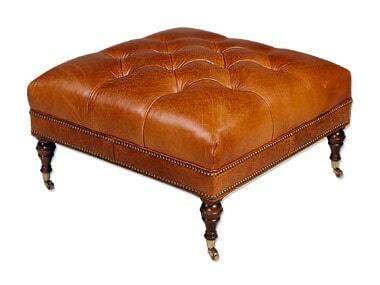 Back to my ottoman. Here it is in the room. Not too shabby. Is it worth the time, searching, headaches, doubt, etc.? Well, it might be if you’re particular like I am, but short on funds! Questions, concerns, social commentary on the prison system in America? Next week I’ll be looking at an unexpected color combo for the kitchen that may have you rethinking the classic all white. And if you have any friends that you think might enjoy this blog, please pass along! You’ll earn my eternal gratitude. What a great article Amy!